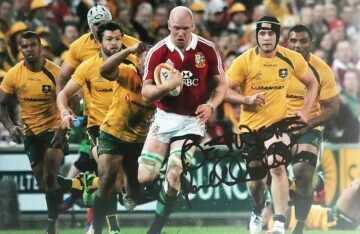 Signed British and Irish Lions Rugby shirts, balls boots, photos and other memorabilia. All of our autographed items come with full provenance in the form of Certificate of Authenticity. We offer fast worldwide delivery and free UK delivery. 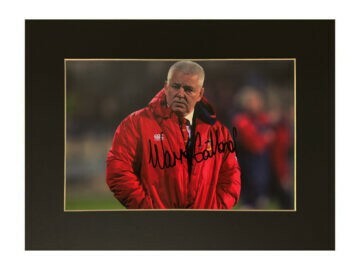 Many of our Britsh and Irish Lions autographs come with a photo of the actual signing! Birthplace of rugby Britain has long been home to one of the world’s most respected and revered national teams. 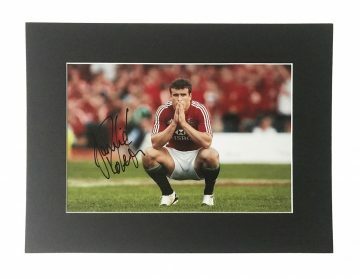 Rugby is a much-loved national sport, a passion that is reflected in the huge amount of support the British and Irish Lions receive at international tournaments and friendlies alike. The inception of rugby is credited to schoolboy William Webb Ellis, ‘who with a fine disregard for the rules as played in his time took the ball in his arms and ran with it.’ At the time rugby and football were one and the same – this incident was to become the catalyst for rugby branching out as a sport in its own right. In 1871 the Rugby Football Union was formed, and with that leagues were created and rugby secured a sacred space in the hearts of British sports fans forever. The British and Irish Lions first came into existence in 1888, but it wasn’t until 1950 that the side officially adopted the name during their tour of New Zealand and Australia. The side is selected from elite Home Nations players for hotly anticipated tests and tours. The British Irish Lions have three major rivalries internationally – with Australia, New Zealand and South Africa. Their track record against Australia totals 17 wins and just 6 losses over the years. New Zealand is known as the Lions’ fiercest rivals – with the British side claiming just 6 wins to New Zealand’s 29 triumphs. South Africa are similarly strong – and close competitions are a trademark between the two sides. To date, the Lions have won 17 games and drawn 6 compared with 23 wins for South Africa. 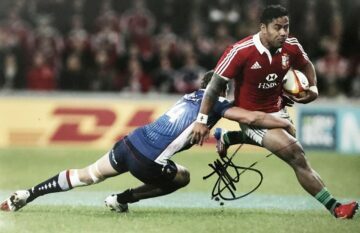 At Firma Stella we’re proud to stock 100% genuine British & Irish Lions rugby memorabilia, sourced directly from our trusted partners. 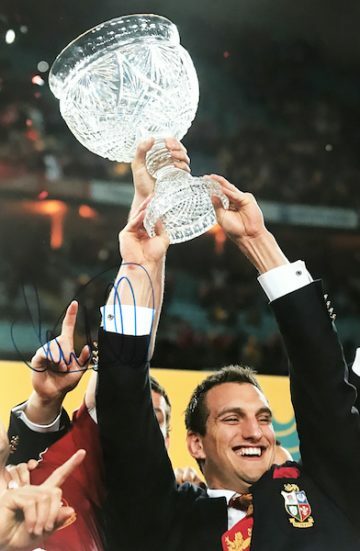 Browse our collection to find signed rugby balls, shirts and mounted photographs celebrating some of the Lions’ most remarkable triumphs.